Data protection capabilities are critical to any organization, so choosing a good backup application is essential. 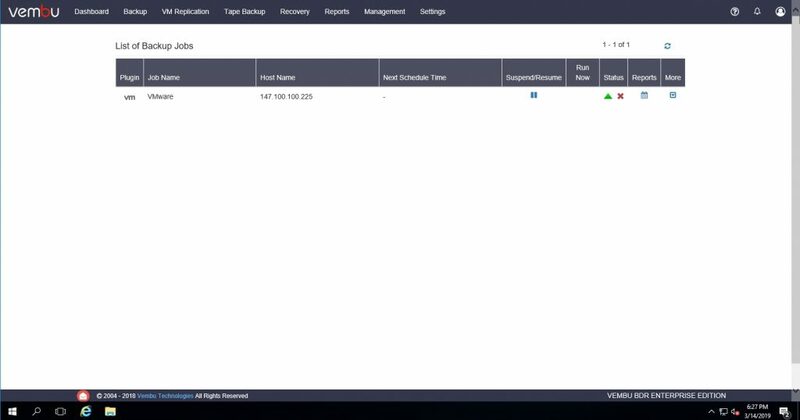 Over the past few years, I have been consistently hearing good things about Vembu BDR Suite – an enterprise-grade backup application that is designed to work in both VMware and Hyper-V environments. I was curious to see how Vembu BDR Suite stacked up against some of the other players in the backup market, so I decided to take the latest version (4.0.0) for a test drive. In an effort to evaluate the Vembu BDR Suite, I downloaded an evaluation version of the software from the Vembu Website. The download consisted of a 615 MB executable file. Vembu provides a very easy to follow installation guide on its Website, but I am guessing that most people probably won’t need to use the guide because the installation process is extremely straightforward. For the purposes of this review, I installed Vembu BDR Suite onto a Windows Server 2016 machine with 10GB of RAM. The software can also be installed on Windows Server 2012, Windows Server 2012 R2, Windows Server 2008 R2, Windows 10, and Windows Server 2019. Once the installation was complete, I logged into the management console, and was taken to the screen shown in the figure below. As you can see in the figure, my first task was to create a storage pool. I found this process to be very easy and intuitive. This is the view that appears when you open the console for the first time. With the storage pool in place, the next thing that I wanted to do was to create some backups. Vembu BDR Suite Enterprise Edition supports backing up VMware vSphere, Microsoft Hyper-V, Microsoft Windows, and various applications. File level backups are also supported. You can see what the Backup menu looks like in the next figure. Vembu can backup VMware, Hyper-V, Windows, and various applications. I decided to begin my evaluation by backing up a VMware deployment. Upon clicking on the VMware option, I was taken to a screen prompting me to enter the hostname or IP address of my vCenter either an ESXi server or a vCenter Server. After doing so, I clicked the Backup link that appeared next to the server that I added. 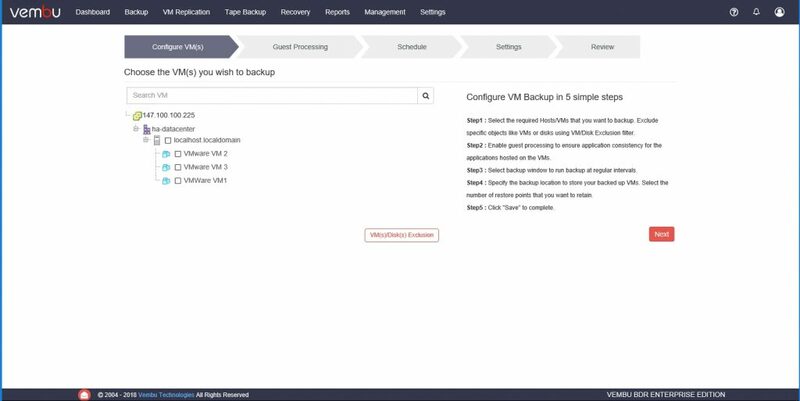 Next, I was taken to the screen shown below, which walks you through backing up your VMware environment in five steps. 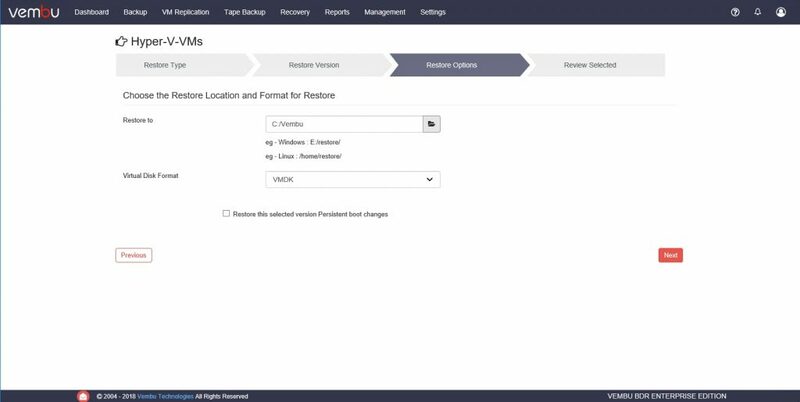 Vembu BDR Suite can backup VMware environments in five easy steps. Setting up the backup job couldn’t have been easier. 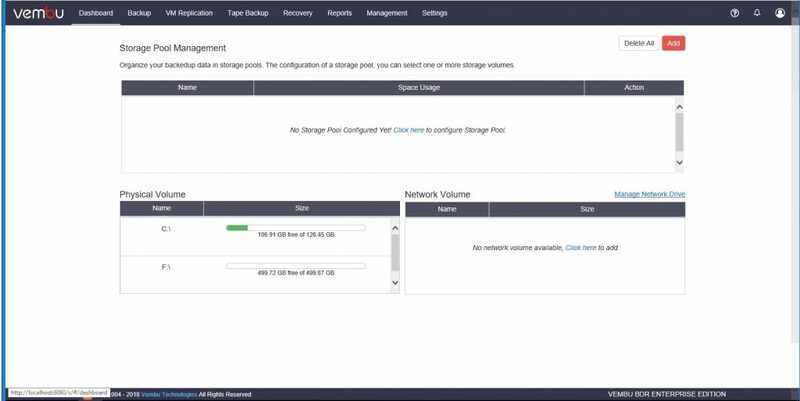 I simply selected the resources that I wanted to back up, enabled application awareness for the virtual machine backups, configured my backup schedule, picked my storage pool, and the backup job was created. It is worth noting that Vembu did not abandon functionality in the name of simplicity. The backup wizard does allow you to configure advanced options such as retention and encryption settings. One of the things that I particularly liked about the wizard is that it contains an option to run the backup immediately upon creating the backup job. You can see what a running job looks like in the figure below. My VMware backup job is running. Next, I decided to try a Hyper-V backup. 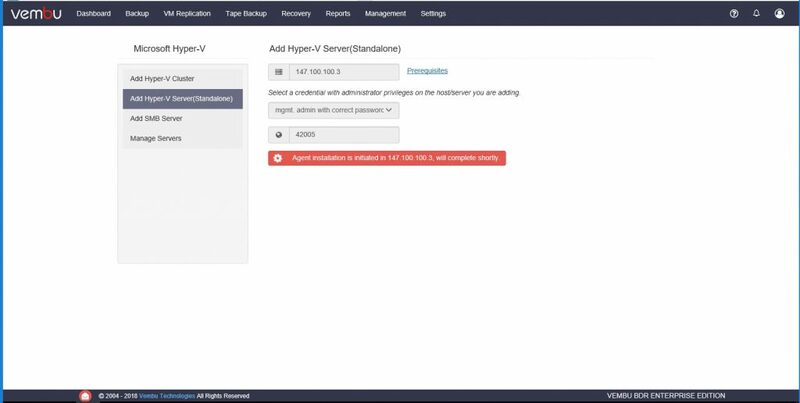 Vembu BDR provides options for adding both Hyper-V clusters and standalone Hyper-V servers, as shown in the next figure. You will also notice in the figure that when you add a Hyper-V server to the Vembu software, an agent gets installed on the server. Once the Hyper-V server has been added to Vembu BDR, the process of backing it up is nearly identical to that of backing up a VMware environment. I was really glad to see that Vembu provided a consistent experience across hypervisors, rather than implementing two completely different processes. An agent is being installed onto a Hyper-V server. Vembu VBR offers several different options for the restoration of virtual machines. As you can see in the next figure, these options include Quick VM Recovery, Live Recovery to Hyper-V Server, File Level Recovery, Disk Management Mount, and Download. Vembu BDR provides a variety of recovery options. The Quick VM Recovery feature is what is commonly known as instant recovery. It refers to the ability to instantly mount a VM backup on the backup server with very little down time. Live VM recovery refers to restoring the VM to the Hyper-V server. The File Level Recovery option allows you to restore individual files and folders without having to restore the entire virtual machine. The Disk Management Mount option lets you mount the virtual machine’s virtual disk as a local disk so that you can browse its contents and recover data. Finally, the Download option allows you to download individual virtual disks (VHD, VHDX, etc.). I started out by testing the Disk Management Mount option and found that it worked exactly the way that it should. Next, I decided to try the Download option. Much to my surprise, the software provided the option not only to download the virtual machine’s VHDX file, but I was also given the option of downloading the virtual machine’s virtual disks in VMDK format as well. You can see what this looks like in the figure below. The software allows a Hyper-V virtual disk to be converted to a VMDK file. Being that I was able to convert my VHDX-based virtual disks to VMDK format, I decided to see if the software would allow me to restore a Hyper-V virtual machine to a VMware server. As you can see in the next figure, the software did indeed offer that option. If you look at the next figure, you can see the Hyper-V Manager superimposed over the vSphere client. You will also notice in the figure that I was able to restore a Hyper-V VM to a VMware host. I successfully restored a Hyper-V VM to a vSphere host. 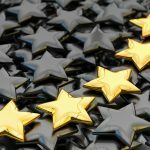 When I write a review for this site, it has become customary for me to end the review by giving the product that I am reviewing a star rating, ranging from 0 to 4.5 stars. Overall, I really liked Vembu BDR Suite, and decided to give it a score of 4.5 stars, which is a Gold Star award. I found that the product did exactly what it was supposed to do, and I didn’t run into any bugs while evaluating the product. The only negative issue that I ran into was some of the error messages that are generated. Early on, I had some Hyper-V backups fail. The error messages flashed across the screen so quickly that I had trouble reading them before they disappeared. I knew that the backups had failed, but was left wondering why. Eventually I tracked down the error within one of the reports, and the report did help me to resolve the issue. (I was trying to back up a VM containing a checkpoint, which is not supported.) Even so, I wish that the error’s cause had been more obvious. In spite of that one flaw, I liked Vembu’s clean, intuitive interface.